South Carolina has a diverse community of plants, which entirely or at least partially float on the water's surface. Although many floating plants are extremely attractive and are a large part of the water gardening industry, they often create serious problems when introduced into stormwater ponds. Free Floating - These plants float freely on the water surface. The entire plant is suspended on the water, allowing the plant to be moved around the pond by wind and water currents. Plants such as duckweed, mosquito fern, waterhyacinth, and watermeal are free floating. Submersed Floating-leaved - These plants are anchored by roots to the bottom of the pond, but their leaves and flowers grow to and float on the water surface. Plants such as waterlilies, lotus, watershield, and spatterdock are floating-leaved plants. Trailing Floating - These plants are rooted into the shallow areas nearest the bank and have a "trailing"or"creeping"growth habit which allows them to form floating mats that extend out over the water surface. Plants such as waterprimrose,alligatorweed, pennywort (dollarweed), parrot-feather, and smartweed form trailing floating mats. Are floating plants good to have in stormwater ponds? No, mostly. The primary purpose of a stormwater pond is to manage stormwater runoff to prevent flooding and reduce pollutant loading to rivers and beaches. Floating plants have great potential to interfere with how a stormwater pond manages runoff. Free-floating plants are a significant threat because of their mobility. They can and will move to the outfall and clog the structure, which is responsible for regulating water level in the pond. A clogged outfall will force water to back-up through the system and cause flooding around and above the pond. Submersed floating-leaved plants interfere with the flow of water through the pond and can create areas of accelerated sedimentation and stagnancy. These plants impede flow and may reduce the pond's ability to trap and treat pollutants, increasing the likelihood that pollutants will be discharged to receiving rivers and beaches. Trailing floating plants also have the potential to impede flow and contribute to rapid sedimentation, but trailing floating plants do provide one benefit. They can protect shorelines from erosion and stabilize banks. For this reason it is recommended that trailing floating plants be limited to the shoreline but not removed entirely, except for the highly invasive species such as alligatorweed and water primrose. All floating plants have the potential to create a barrier on the water surface that prevents oxygen exchange with the atmosphere and photosynthesis in the water; therefore, uncontrolled growth of floating plants will reduce oxygen in the water and increase the potential for a fish kill. It is recommended that floating plants be prevented from covering more than 20% of the pond surface. Should I plant floating plants in my pond? No. Aside from the problems previously mentioned for stormwater ponds, it must be noted that most floating plants have very fast growth rates. What may seem harmless this year could get out of hand very quickly and cost your community a lot of money to fix. 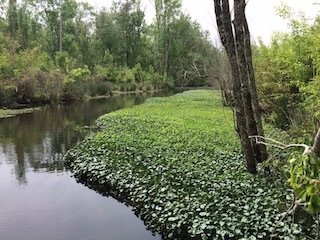 Also, many floating plants are considered illegal aquatic plants in South Carolina and transportation or sale of these plants is a violation of state law (see SC DNR Aquatic Nuisance Species program). How do I control floating plants in my pond? This depends on the species of plant. Small free floating plants such as duckweed, watermeal, and mosquito fern can be controlled by stocking the pond with tilapia at a rate of 400 fingerlings per acre. They are very difficult to control by mechanical or manual harvesting, but there are several herbicides that can be effective. Larger free-floating plants such as waterhyacinth and waterlettuce can be harvested, but they are not eaten by tilapia or triploid grass carp. Trailing floating plants are not controlled well by fish. They can be controlled by persistent manual removal, but fragmenting the plants might cause new populations to establish in other parts of the system. They can be controlled using a variety of aquatic herbicides. Submersed floating-leaved plants can only be controlled by dredging or herbicides. Several herbicides are useful for controlling floating plants and, if applied according to the label, will not impair the aquatic environment. If herbicides are necessary to control floating plants in stormwater ponds, the community should contract a licensed applicator to apply the herbicides. Residents and HOA Board Members should NOT apply herbicides to stormwater ponds, rather they should contract a lake management company that is licensed to apply aquatic herbicides. Commercial herbicide applicators must be licensed and insured and should possess the necessary knowledge and equipment to make the applications effective and safe. When seeking a lake management company, consider using one that is a certified Master Pond Manager.